Driving the heart of the industry is none other than pure on-contract handset pricing, but as time passes on by, prices are generally lowered greatly to attract customers. 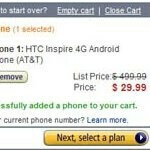 Already, we’ve seen RadioShack offering the still desirable HTC Inspire 4G for $29.99 with a contract, but now it looks like Amazon is following suit to compete. More than considered to be a great value even at its usual price of $99.99 through AT&T, the handset’s price drop to $29.99 is indeed fabulous – even more when you’re getting a top-notch smartphone from HTC’s camp! Fortunately, the deal isn’t simply only available to new customers, but it’s offered to existing customers as well with qualified upgrades. Naturally, free two-day shipping is included with the deal to further save you more money. Sure it might not be as highly prized when compared to some of the newer Android devices on AT&T’s lineup, but it’s still nonetheless decent with its new pricing.